1. Other than the elephant and the rhinoceros, the hippopotamus is the largest animal on earth. 2. There are two main species of hippopotamus. The first species is the common hippo, or large hippo. The technical name for this species is the Hippopotamus amphibious and it is generally found in East Africa. 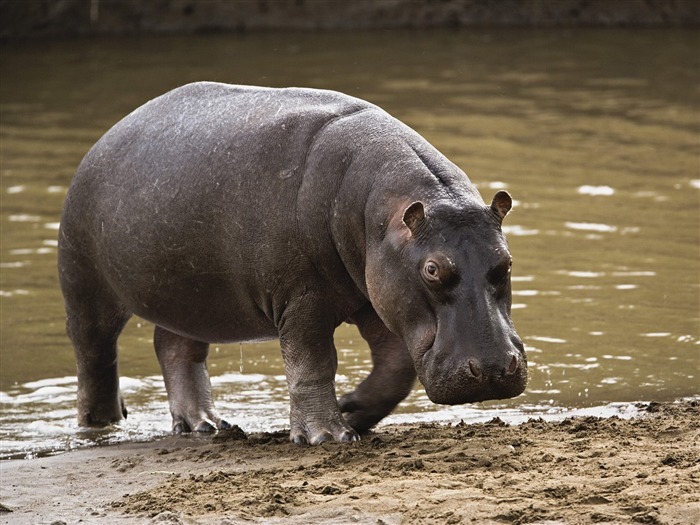 The second species is the pygmy hippo, or Choeropsis liberiensis, which is found in West Africa. 3. The hippopotamus can weigh as much as 7000 pounds and they can measure 13 feet long and 5 feet tall. 5. Despite their massive size, the hippopotamus is an herbivore, meaning they only eat plants and vegetation. 6. Hippos spend most of their time in the water. They do, however, emerge from the water during the nighttime so they can graze. 7. Hippos mate and give birth while they are in the water. 8. One misconception about hippos is that they are related to the pig family due to their structure and bodily design. However, they are not related to the pig family. Instead, they are related to the porpoise and whale family. 9. When hippos are in the water, they are very territorial about their space. When they are roaming around on the land, however, they are not territorial at all. 10. Hippos can run as fast as 19 miles per hour for very short distances. That’s quite a bit faster than the speed that humans can run! 11. There are only between 125,000 and 150,000 hippos living in the world today. 12. Groups of hippos are known as either pods or herds. 13. One of the leading causes of hippopotamus depopulation is because humans hunt them for their ivory teeth and their meat. A hippo’s teeth are more valuable than an elephant’s because it does not turn yellow over time. 14. Hippos are some of the most aggressive and dangerous animals on the African continent. 15. The general lifespan for a hippopotamus is between 40 and 50 years. 16. Hippos can consume as much as 150 pounds of food each day. 17. Pygmy hippos generally exist only in pairs rather than larger groups. They are generally seen as a mating pair or as a mother and her calf. 18. Pygmy hippos do not like conflict. They are more likely to walk away from a fight with their enemy rather than be aggressive with them. 19. The gestation period for pygmy hippos is between 190 and 210 days. A mother hippo typically gives birth to a single calf, but they have been known to give birth to twins in very rare cases. 20. The main predators for hippos include lions, hyenas, and crocodiles. 21. The skin of a hippopotamus can weigh as much as a third of a ton, but it is still very delicate. 22. A hippo’s head accounts for about one-third of its entire body weight. 23. Since they don’t have sweat glands, hippos need to stay in the water for about 18 hours a day to keep their skin wet. Otherwise, if their skin dries out, they can become dehydrated. Their skin can, however, secrete a mucous-like substance that is called “blood sweat” in order to protect its skin from sunburn. 24. Mothers nurse their baby hippos for about 8 months before weaning them. 25. Hippos are very vocal and noisy. Some hippos have been recorded as making noises as loud as 115 decibels, which would be likes standing about 15 feet away from the speakers at a loud concert.